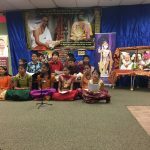 The third day of the Madura Utsav at the DFW Hindu Temple commenced with Bhagavatam parayanam and continued with the Govardhana Leela on Saturday, November 24th 2012. The Bhagavatas who first visited Mathura through this Krishna Katha, then travelled to Gokulam and had now arrived at Brindavan. The devotees had decorated the vicinity of the discourse with a Govardhana Giri depicting the highlighted event. 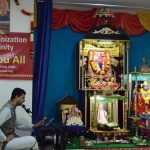 Shri Ramanujamji extolled the Nava-vidha bhakti very beautifully, and compared the Navaratna Leela and Gokula Leela. He then went on to explain the reason why one greets each other with ‘Radhe Radhe’, stating that Radha Devi was the ‘prema’ of Krishna, and saying her name would please Krishna even more and he would follow suit. 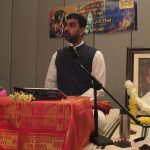 Shri Ramanujamji compared Srimad Bhagavatam to Sri Krishna, and how each Canto represented the different parts of the Lord. 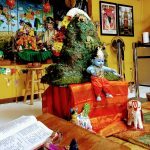 In summary, Srimad Bhagavatam represented nothing but the Krishna Swaroopa! Shri Ramanujamji vividly described the Leela, taking the Bhagavatas all the way to Brindavan! The Satsang concluded by Annakoototsavam, followed by Mahaprasad. 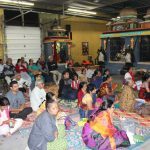 The devotees who had enjoyed Bhagawan’s wonderful Leela were looking forward to celebrate the Divine Vivah the next day!